Walter Wagtendonk OBE has been asking questions of politicians, government departments and aviation operators about the true costs of the AIA’s AIRCARE™ safety management system, its value for operators and the transparency of its implementation process. At Cuatro Vientos air base in Spain, Pacific Wings’ UK and Europe correspondent, Peter Cooper, discovered that the UK and New Zealand don’t have the monopoly on outstanding vintage aircraft displays. The story of two visionary Kiwi aviation enthusiasts who persevered in bringing a new and unique aviation programme to TV viewers around the world. 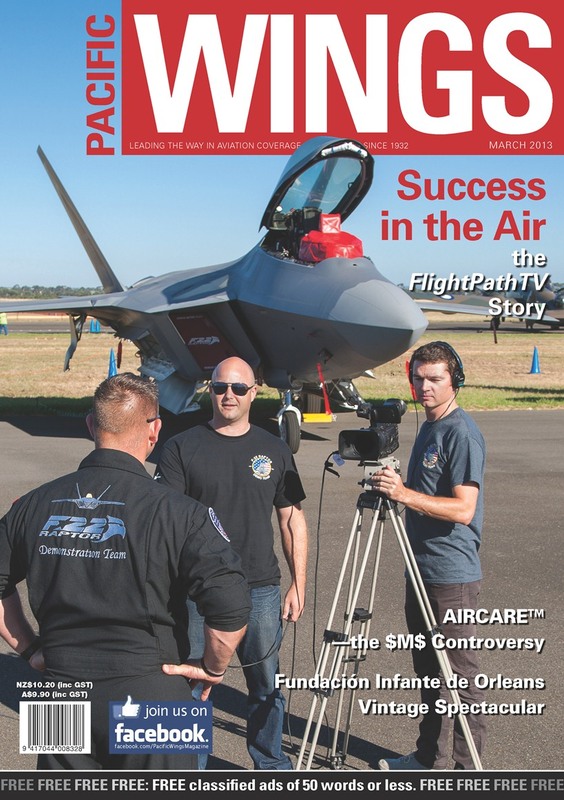 Dita de Boni talks to Fletcher Mckenzie and Malcom Clement of FlightPathTV. Murray Kirkus’s article on the growth of air travel in the Philippines highlights an increasingly common problem affecting aviation around the world—air transport’s expansion outpacing the infrastructure it needs to support it. Paul Sortehaug continues his series of articles on New Zealand’s air aces with the story of Flying Officer Brian John George Carbury, DFC and Bar.